The Karachi Zoo has seen the birth of 25 Russell’s vipers in a single litter, raising the number of this species to 31 at the facility. The last births in Russell’s vipers happened in 2008. The zoo lost the young ones within a few days of their birth whereas their parents survived for some years. “The babies are currently being kept with their parents but we will separate them from one another as this species is known to be cannibalistic,” said Dr Mansoor Qazi, the zoo director, adding that the young ones were being fed with worms and bugs. Unlike most snakes, which lay eggs, Russell’s vipers give birth to live young ones. “This snake is viviparous (giving birth to living young that develop within the mother’s body rather than hatching from eggs) and produces up to 50 young ones in a litter. The gestation period is three to six months,” added Dr Qazi. The Russell’s viper, he said, was one of the four large snakes found in the subcontinent and known to be highly venomous after krait, another large snake. “The species has no problem living in highly populated areas. It’s responsible for causing the most snakebite incidents and deaths among all venomous snakes. 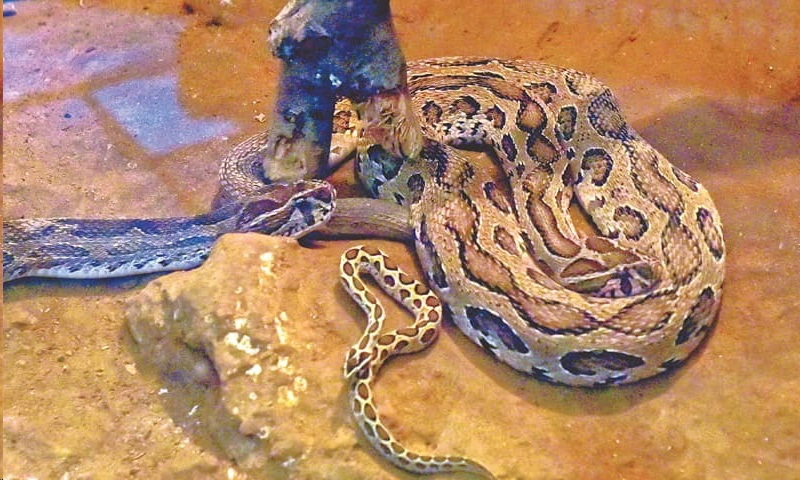 Its venom is used in different medicines,” he said.